When we think of art house films, we don’t usually think Brunei. However, Bruneian filmmaker, Abdul Zainidi has been trailing international film festivals with his own brand of Bruneian art house cinema he calls Brurealism, a blend between Brunei elements and surrealism. Trained as an actor, Abdul made the decision to go behind the camera to tell his own stories. He has made many short films since and ‘Bread Dream’ was selected to be screened at Cannes Film Festival in 2012. His first feature film ‘Anggur in Pockland’ is also Brunei’s first art house film and made its debut at the Asian International Film Festival. Being a relatively small country where the focus tends towards other sectors, there was lesser emphasis on the arts. But that has definitely changed now. Musicals and theatre presentations have slowly increased in Brunei ever since drama studies was introduced to the curriculum. And that was fairly recent, only about 6 years ago. The same evolution can be seen in filmmaking. When I started out in 2010, there weren’t many local youths dabbling in the art of making movies from a DSLR. Many were merely recording wedding videos and taking portrait shots. The major filmmakers were mainly from a television background and during that time Brunei did not have a film school. So handling a DSLR was purely for recreational purposes. I was trained in theatre. I would say I was fortunate to be able to take on the art and even prove my worth on the theatre stage. For me, stage acting is a discipline that you carry with you throughout your whole life and can be applied pretty much anywhere. When speaking to the public, it has proven to be very useful to 'captivate' people and to allow them to listen to your stories or 'pitch'. While acting I was always playing somebody else's words and at some point, I too felt that I wanted to make my own ‘words'. So, I decided to write a scene every now and then and that became a story. The fundamentals storytelling for me always goes back to Aristotle's rules of storytelling. For me, characters, a conflict and resolution are the main ingredients of a story. But I tend to turn up the 'mystery' factor. I don't consider myself an expert filmmaker. For me, the story I 'conjure' holds more weight than the film itself. it's like being a magician I suppose. After all, You are conjuring a fictional world. If I write a scene about loneliness, I tend to film my character overlooking a desolate jungle field or even a dead ant being marched over by other ants to heighten the sense of loneliness in a poetic and peculiar way. For me, filmmaking is like an art tableau. I tend to film a lot in guerrilla mode whenever I am on the go. Sometimes I just capture what I see around me and then if I feel it is suitable, I would use it and write something about that particular scene or landscape I filmed. This was how I did my 'vanishing children' series. Brurealism is indeed a blend of Bruneian elements and the surreal. I wanted to distinguish myself from my other filmmakers in Brunei. They had bigger budgets and more manpower and so I decided to be more 'humble' in my approach and focus more on the story and make it a unique one. Even as an actor, I’ve always wanted to stand out by being the dark horse or the odd one out. I would say my style fluctuates more towards filmmakers and culture that inspired me. I adapted from the French art scene a melancholic beauty that I diffuse into my Bruneian films. In 'Anggur in Pockland' my first feature film, I decided to tackle unemployment and the feeling of being desperately idle in a poetic and subtle way à la Française. So, I used the grapes as a metaphor. Anggur means grape in Malay but anggur also means 'stagnant' and the grapes transport the protagonist to Pockland ,a place free of woes. In Paris, I made a short-lived web series called Brunei in Paris about a clown from Brunei called BIP who finds himself magically transported to Paris where he speaks Bruneian and also gets the French to utter a few words. It was an 'experiment' of sorts and once again, the idea is to give a taste of what it is to be Bruneian in a foreign land. I donned the traditional Malay dress complete with songkok and that aroused the curiosity of fellow Parisians and also made room for some interesting drama. So I called it Brunei in Paris. My plan is to continue this in April this year, before heading to the Cannes film festival where I will attend and present my project 'Worm and the Widow'. I recently spent a year in Busan where I was awarded a scholarship to study at the Busan Asian Film School. There, I developed a deeper richer understanding of Asian cinema and also developed my second feature film project 'Worm and the Widow'. It’s a story about outsiders, a mute and a widow who live in a remote village where everybody knows everybody's business and their friendship causes controversy. 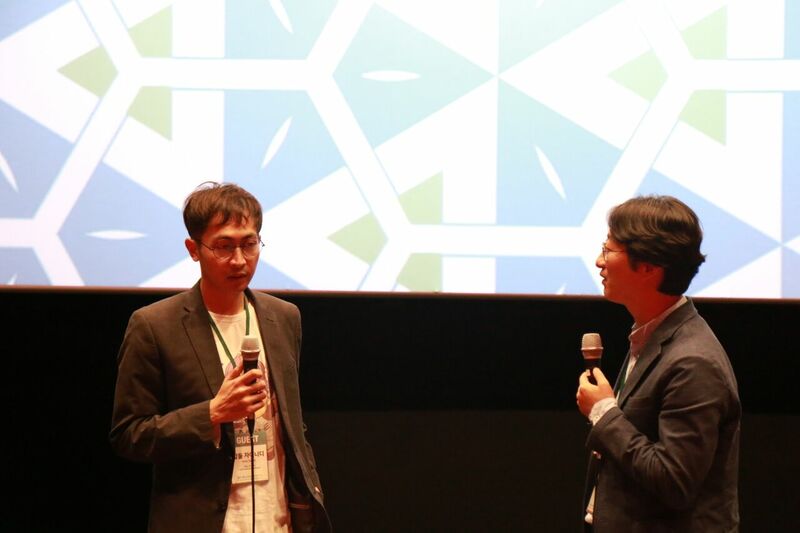 The project was pitched and won an award at the Bucheon International Fantastic Film Festival and I plan to bring it to Europe in countries like France. I also finished several short films which I shot in January, 'Anak-anak hilang' & 'Teluki' both horror themed. ‘Anak-anak hilang’ is my latest vanishing children film and is 100 percent in the Bruneian language, whereas previous films in the series have been narrated in English. I don't consider myself mainstream in Brunei. Our ministry looks down on arthouse films at times and almost considers them a disguised political message. I feel that even with the support I have from some bodies in Brunei, the ministry does not always recognise the efforts of people like me who bring local arthouse and experimental films outside of Brunei. I feel that our film industry is booming but only a handful are helped and others are relegated to the side. It is often these outsiders like myself that are able to do more for the country than those who are on the inside and for that, I am proud. Especially of my recent award win at Bucheon International Film Festival. I'm confident I will be an important contributor to Bruneian cinema outside Brunei even if my own ministry fails to recognise that. As I mentioned, it is often the dark horse that pulls it off when others least expect it. Got something worth talking about?